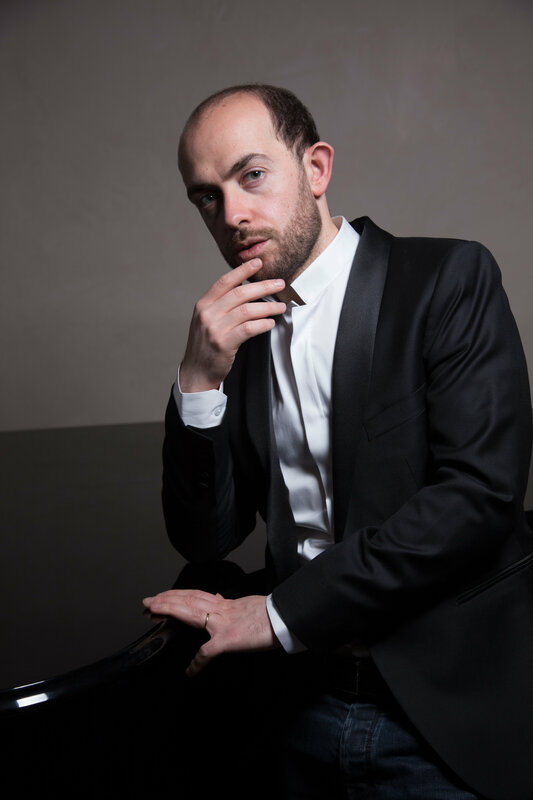 French pianist François Dumont’s international career has been launched by his success in major international piano competitions winning prizes in the Chopin Competition, the Queen Elisabeth Competition, the Clara Haskil Competition, the Montecarlo Piano Masters. He has been nominated for the Victoires de la musique, a major French classical music event. He has received the Prix de la Révélation from the Syndicate of Music Critics in France. François Dumont has been chosen by Leonard Slatkin to play and record both Ravel concerti with the Orchestre National de Lyon. The CD will be issued for Naxos during the 2019 season. He appears as a soloist with orchestras such as the Cleveland Orchestra, the Mariinsky Theater Orchestra, the Montecarlo Philharmonic, the Warsaw National Philharmonic, the Orchestre national de Lorraine, the Orchestre National de Lille, the Orchestre National d’Ile-de-France, the Orquesta Nacional de Colombia, the Orchestre de Chambre de Lausanne, the Tokyo Symphony with conductors such as Jesùs Lopez-Cobos, Antoni Wit, Arie van Beek, Philippe Bender, Rani Calderon, David Reiland, Stefan Sanderling, Alexander Sladkovsky. François Dumont is invited to perform recitals in major venues such as the Festival International de la Roque d’Anthéron, the Piano aux Jacobins Festival à Toulouse, Chopin Festival in Nohant, Radio-France Montpellier Festival, Chopin à Paris Bagatelle Festival, Chopin and his Europe Festival in Warsaw, Nuits du Suquet in Cannes, Journées Ravel in Montfort l’Amaury, Ljubljana Festival, Kennedy Center in Washington. He regularly tours Japan, South Korea and China. His chambers music partners are Tabea Zimmerman, Augustin Dumay, Henri Demarquette , Xavier Philipps, the Prazak, Sine Nomine, Talich, Zemlinsky, Voce and Debussy Quartets. With Virginie Constant and Philippe Aïche, his is part of the Trio Élégiaque, which whom he recorded the complete Beethoven and Schubert Trios. His first solo recordings, the Complete Mozart Sonatas (Anima Records) and a Chopin album (Artalinna) both received the “Maestro” award of the “Pianiste” magazine. Other solo recordings include a Wagner/Liszt programme (Piano Classics) as well as a double CD live that includes all his performances at the Chopin Competition, published by the National Chopin Institute in Warsaw. His recording of the complete piano music of Maurice Ravel (Piano Classics) has received both critic (FFF Telerama, 5 Diapason) and public acclaim. Two B.A.C.H. project have been released by Artalinna, of which the famous critic Jacques Drillon wrote : « coherence, dignity, richness of affects. One thinks of Edwin Fisher ». His recent recording of Mozart Concerti K.271 and K.466 with the Orchestre Symphonique de Bretagne have been praised for their “clarity of elocution”, their “ideal sense of equilibrium” and “delightful classicism”. During the 2018-19 season, he is invited to perform Franck and Ravel concertos with Les Siècles orchestra conducted by François-Xavier Roth. Concerts will take him to Taïwan, Luxembourg, Ireland, Belgium and Russia. He will give a concert tour with Orchestre des Pays de Savoie with Mozart’s « Jeunehomme » concerto. His debut in the Paris Philharmonie will take place in February 2019 with Schumann piano concerto.